As the majority of the over 4.3 million South Asians in the United States are foreign-born, the rights and welfare of immigrants in this country are understandably a top priority for our community. Like most immigrants, South Asians possess a range of immigration statuses. The South Asian community includes undocumented immigrants, dependents, and temporary workers on various visas, refugees and asylum-seekers, lawful permanent residents, and United States citizens. Unfortunately, the immigration system and immigration policies have negatively affected many South Asians, regardless of status. For example, numerous members of the South Asian community have faced obstacles in attaining permanent legal status and citizenship and suffered the impact of various harsh enforcement initiatives, such as the National Security Entry-Exit Registration System (NSEERS). Additionally, South Asians have been subjected to discriminatory profiling through immigration policies that sometimes result in their deportation for low-level offenses. Of course, these practices also make it increasingly difficult for South Asians to access the rights to which they are entitled. SAALT supports a just and humane approach to immigration reform that includes a path to citizenship for undocumented immigrants; elimination of the visa backlog; robust worker protections; and enforcement provisions that respect civil rights and due process. Guided by input from South Asian community-based organizations, SAALT advocates for broad immigration reform that addresses the needs of all South Asians. 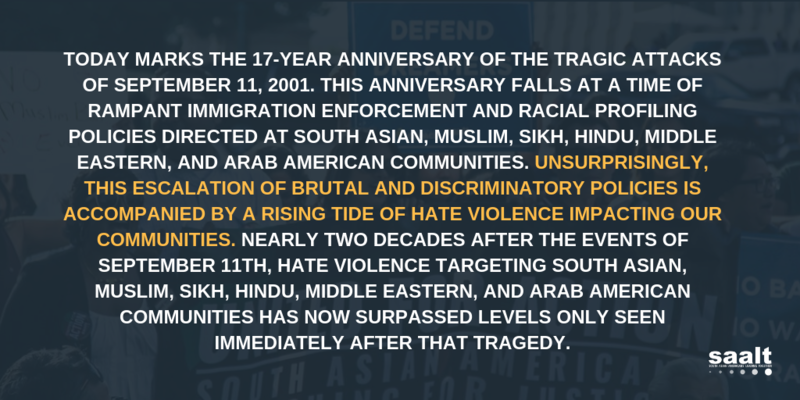 SAALT also develops community education materials analyzing proposed legislation’s unique impact on South Asians. View Deepa Iyer’s Testimony before House Subcommittee on Immigration, Refugees, and Citizenship (April 2006). Immigration Reform and the South Asian Community: Myths and Realities (September 2007): SAALT has produced this community education document to dispel common myths about the impact of the immigration system on South Asians. This document also provides stories collected from press articles and through SAALT’s Documentation Project that illustrate the challenges and obstacles faced by South Asian workers, women, youth, and families.